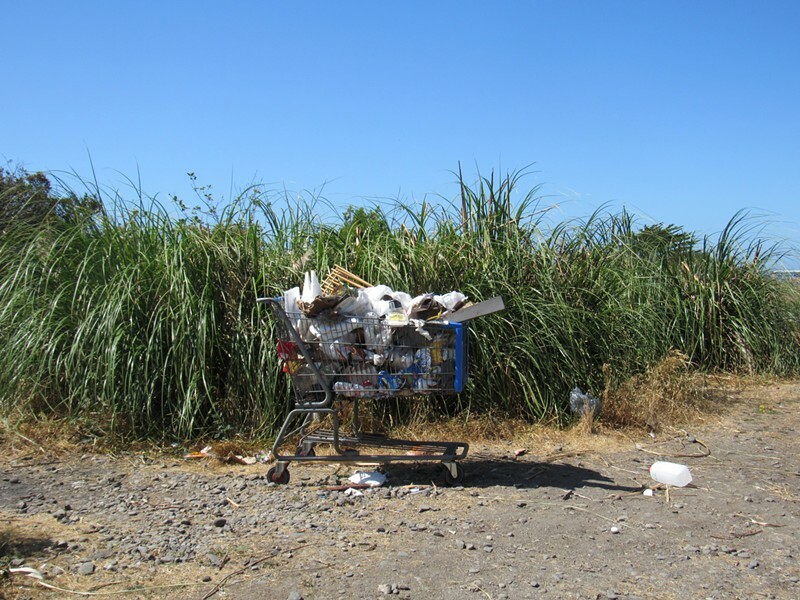 A shopping cart sits near the Devil's Playground behind the Bayshore Mall. The Humboldt Housing and Homeless Coalition released a final draft of its Point in Time Count today, which you can find here. While the overall figures seem to indicate a jump in the number of homeless people in Humboldt, (1,319 people in 2015, up from 1,054 in 2013), organizers of the biannual tally say that improved methods, including a shorter form, may have contributed to more complete data. Some advocates in Southern Humboldt say the tally, which was done in late January, gives an inaccurate picture of the impact transients can have during the fall months, when migratory workers flood Garberville and Redway looking for seasonal work on marijuana grows. One thing that appears to be clear is that the number of those without a bed far exceeds the beds available. In Eureka alone, where more than half of Humboldt County's homeless live, there are three times as many heads as there are emergency shelter beds. The 2015 homeless Point in Time (PIT) count report has been finalized, showing a total of 1,319 homeless, including 32 children—265 more homeless people than were counted during the 2013 PIT. More than 30 agencies and 100 trained volunteers assisted in this year’s PIT count which showed Eureka having the county’s largest homeless population, followed by Arcata and Southern Humboldt. The biennial PIT count, conducted by the Humboldt Housing and Homeless Coalition (HHHC), documents the number of sheltered and unsheltered homeless persons. The count takes place in communities across the U.S. on a single night in January. For Humboldt County, this year it was Jan. 27. Starting the morning after and going through the week, volunteers connected with homeless people throughout the county to administer voluntary surveys with questions about age, physical and mental health status and where they had slept on the designated night. The count is a U.S. Department of Housing and Urban Development (HUD) requirement. Information gathered during this count is used by local planning departments and by county nonprofit agencies in applications for grant funding and planning. 4. Individuals and families who are fleeing, or are attempting to flee, domestic violence, dating violence, sexual assault, stalking or other dangerous or life-threatening conditions that relate to violence against the individual or a family member. People living with friends or relatives, as well as people staying in motels, are not considered homeless, per HUD’s definition. The count is not scientific, but provides a picture of the homeless population at a specific point in time. “It provides a snapshot of our homeless on a specific night,” said Karen “Fox” Olson, executive director at Arcata House Partnership and co-chair of the HHHC. She said this year’s PIT was a success, which she credits to a few things. Olson said they also set up hubs throughout the county where homeless people could come and be interviewed, including the Arcata House Annex, Betty Kwan Chinn Day Center, North Coast Veterans Resource Center, Fortuna Adventist Community Services, Redwood Teen Challenge, Church of the Joyful Healer and WISH-Women’s Crisis Shelter In Southern Humboldt. The 2015 PIT Count committee included the North Coast Veterans Resource Center, Arcata House Partnership, DHHS, Redwood Community Action Agency, Redwood Teen Challenge, the Humboldt County Office of Education and two at-large community members. The count was funded in part by First 5 Humboldt County, the North Coast Grant Making Partnership, St. Joseph Health System and the CCRP. The HHHC is a coalition of housing advocates, businesses, funders, elected officials, service and housing providers, faith-based organizations and other community stakeholders working together to identify and address local housing needs. In Humboldt County, the HCCC is the lead organization for homeless issues and the federally designated Continuum of Care. For more information about the HHHC, visit its website at http://humboldthousing.org/about-the-hhhc/. Sheltered indicates sleeping in a motel, in a trailer or RV, emergency shelter, transitional house or “couch-surfing” on the night of Jan. 27. Unsheltered indicates sleeping in a car, on the street, outdoors or in an abandoned building on the night of Jan. 27.